There seems to be a sudden spate of black beans being used in chocolate cakes. I first came across the phenomenon with a cake I spotted on What I Cooked This Weekend and then these brownies from Hungry Hinny and then I just saw them everywhere. The idea is that the black beans, as well as giving a bit of extra fibre, can reduce the amount of fat in the cake without making it taste less delicious. I was sceptical, but wanted to try it for myself. It’s taken me a while because getting hold of black beans was the hardest part. I adapted my recipe from one I found on Joy the Baker, who in turn got it from Martha Stewart – and so it goes on! Rinsed 1/4 cup cooked black beans (from a tin) & blitzed with my hand-held blender. Melted 2oz unsalted butter in a pan over a low heat with 5oz 85% dark chocolate and left to cool slightly. Beat 3 eggs and 1 1/3 cups vanilla sugar (caster) until thick and creamy. Stirred in the cooled chocolate carefully with the beans. Folded in 1 cup spelt flour, 1/8 cup cocoa, 1/2 tsp baking powder and 1/4 tsp salt. Poured mixture into a 9″ sq cake mould. Placed 16 walnut halves in the middle of the future brownie pieces and scattered with some course Cornish sea salt. Baked for 22 minutes, (making sure they were slightly underdone) at 180C & left to cool – err, slightly! I couldn’t wait for these to go cold before trying them, so I had my first one warm from the oven. All scepticism instantly disappeared as I bit into this most delicious, dark and moist brownie. The crunch of toasted walnuts and spike of salt, made for a great contrast in texture as well as flavour. The salt was a bit of a surprise, especially for CT who was “ambushed by my own expectations” but once he got used to it, thought it was good. As for the beans, it was nigh on impossible to detect them. Despite the small amount of butter, these brownies kept really well, in fact they got fudgier with age and we managed, with commendable restraint, to make them last the week – nearly! What could say love and romance more than brownies? I could think of a few things, but brownies certainly say it for me. With this in mind, I am entering these into Tea Time Treats – fun filled monthly tea parties hosted by Karen of Lavender and Lovage and Kate of What Kate Baked. This month Kate has chosen Romance as the theme. Isn’t it funny, when Mexican food is so popular (assume it is in NZ too) that it’s really hard to get hold of black beans. Good luck with those dried and shrivelled ones! Ooh beans in baking are soo good, and I love the salt & chocolate combo, slightly unexpected and definitely romantic. Think I might add a bit of chilli to these to go with the Mexican feel… but then I am a chilli addict! I never need to look anywhere else for a chocolate recipe inspiration! Oh yes, chilli would be an excellent addition. Chilli brownies have been on my list for ever and I’ve still not made them. These would have been the perfect vehicle. Liz, prune puree sounds really good. I’ve used apple sauce as a substitute, but prunes are lovely in a dark chocolate cake. Why have we deviated? I used to cook much healthier food too – sigh! Rubber brownies don’t quite to it for me Johanna!!! Am really interested in the use of adzuki beans & mung beans in cakes too – have never tried those. Only 2oz of butter? – sounds like the perfect brownie. I’ve seen bloggers use black beans in brownies before, I wonder if they can be used in other recipes too. Although I guess they work best with chocolate recipes due to the colour. Must do a bit of googling on this! I’ve only seen them in chocolate cakes Claire, but I don’t see why other pulses couldn’t be used instead if a lighter colour was required – butter beans maybe??? They look great! I love brownies! I’ve never tried baking with black beans before – but brownies could be a good way to start! A woman after my own heart Clare, not much beats a good brownie! Interesting combination, vaguely remember reading a recipe using them in brownies before. Must try these though. I’m definately going to have to try black beans in brownies… thanks ever so much for entering these brilliant brownies into TTT!! Kate, it’s one of those things that when you hear about it, you’ve just got to try it. I love the way these recipes evolve – I’m quite tempted to try adding some black beans into my entry for the Totnes Clandestine Cake club in a few weeks time…our theme is Bohemian Baking – it would fit well. I’m all for experimentation Kate – go for it! Wow, sounds like something quite different! And looks pretty good! May have to try baking with black beans now! Lottie – it’s quite a revelation! No really, you can’t taste the beans – well I couldn’t anyway. They really were good and it’s not like there is a huge quantity of beans anyway. They did make for a lovely dark colour which I liked too. Oh gosh this looks delicious! I want it now! (Veruca Salt). I’ve bookmarked this and I’m going to give it a go. Thanks for the comment and I’m glad I’ve found your blog. I’m a follower now I hope you’ll support me as well and be mine. Thanks for following and for the comment Veruca 😉 Do let me know what you think if you do get around to making these. I am fascinated with this latest craze. 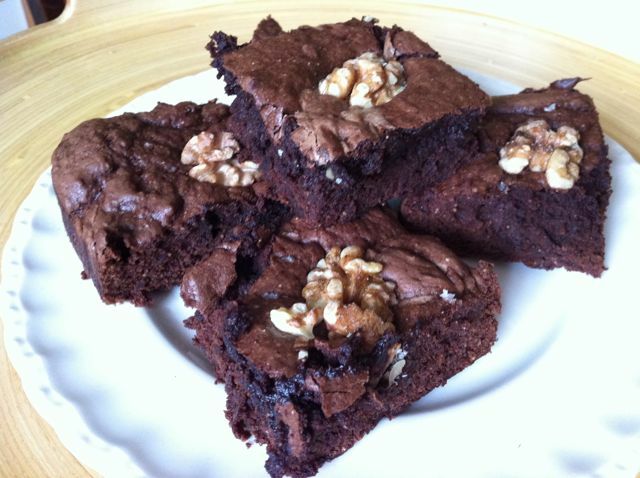 I’m yet to taste anything baked with the black beans, but these brownies look so lush. Must remember this for the future. You know me Chele, I’m always drawn to the more unusual ingredients in my baking. Very clever! And they look great of course. I could go one of those just now. Had a baked potato and salad for dinner, now I want to sin! But baked potatoes are hard to beat Jac – one of my favourite comfort foods. I certainly wouldn’t have thought of using beans in brownies, but I can see the logic. So are brownies your ‘first love’? ha ha! This one really grab my attention, who doesn’t like brownies. They look great! Thanks for commenting in my blog. Ah yes, these should appeal to your South American interest Pilar. Such a strange recipe. I’ve neve heard of black beans being used in this way. I’d love to try it.